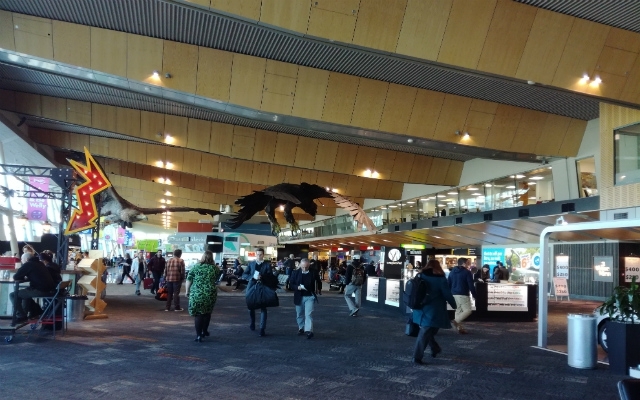 Wellington International Airport is situated in the suburb of Rongotai, eight kilometres south-east of Wellington city centre. International flights operate from four Australian destinations, Sydney, Gold Coast, Brisbane, and Melbourne along with Fiji. The flights are provided by Air New Zealand, Qantas, Jetstar, Virgin Australia and Fiji Airways. Domestic flights are operated by Air New Zealand, Jetstar, Air Chathams, Sounds Air and Golden Bay Air. Travellers can benefit from the free WiFi service that covers the food court area, Fuel Espresso and international Departure Lounges in level 1 of the main terminal building. Car rental companies operate on level 0 of the main terminal. They include Avis, Hertz, Budget, Europcar and Thrifty. A shuttle from the airport to the city centre will set you back about $17 for one person with an extra $5 for each additional person in your group. Shuttles are normally shared with other passengers. A trip to the city centre can take up to 40 minutes when traffic is at its peak, or when there are several drop-offs along the way. A typical taxi fare costs $30 to $40. A trip from the airport to the city centre can take up to 40 minutes during peak traffic periods. Taxi ranks can be found directly outside the baggage claim area on level 0 of the main terminal. Uber also operate and collect on the opposite side of the road of the taxi rank. Airport Flyer is an express bus service that runs from Wellington International Airport to the railway station, city centre and up to Upper Hutt. Buses typically run every 10 minutes, although at certain times it's every 20 minutes. An added bonus is the free WiFi on board. Wellington Airport to City Centre (Courtenay Place) - every 10 minutes on weekdays from 6.30am to 9.00am and 2.00pm to 7.00pm. Approximately every 20 minutes at all other times. On the same route the bus tops at the Railway station every 20 minutes from approximately 7.30am - 9.30am and 2.15pm - 6.45pm. Queensgate to Lower Hutt to Wellington Airport via the City - every 20 minutes. The Airport Flyer departs from the southern end of the airport terminal, level 0 (exit from baggage claim doors on level 0 and turn right) past the Airport Flyer waiting area. View the latest Airport Flyer ticket pricing. Plan you route using the bus timetable. Wellington Airport Parking offers a range of parking options, from the fully secure and covered Premium car park, to the ease and convenience of the Terminal and Heart car parks, or the money-saving Long Term car park.